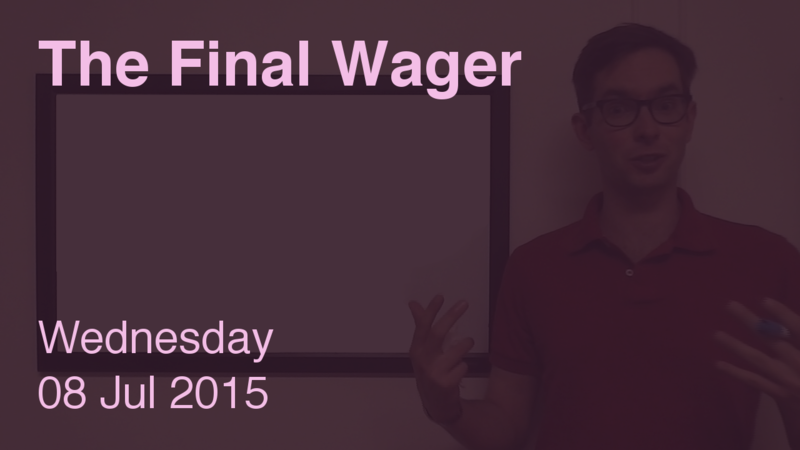 Let’s start with that terrible Penultimate Wager by one of our challengers. Given our players’ proficiency with the rest of this category and the clue’s second-level status, I’d be tempted to go for $10,201 and end things right now. Even if Jenny is wrong, she can still win in Final. The other option is no more than $199. This places Sawyer in Stratton’s Dilemma: if he covers Ian’s wager in Final, he’ll lose to Jenny if he’s wrong. If Sawyer doubles his score, he’ll have 22,000. To cover this all-in wager, Jenny will need to wager 7,200. An incorrect response with that wager will leave Jenny with 7,600. To stay above her total, Sawyer can wager up to 3,400. Ian can wager up to 2,800. A successful doubling will put Ian at 20,800. If Sawyer makes the rational maximum wager of 3,400, Jenny will need to wager 400 to stay above him. In that case, Sawyer would have to wager 4,200 and respond correctly, and again, an all-in makes sense. Ian might consider risking at least 4,800 – everything. Sawyer might go for 2,200. That downside means Ian should cap his wager at 1,600. Then we add a dollar to the minimum wagers, and subtract a dollar from the maximum wagers. It looks like the writers are recycling Final Jeopardy! clues from the Teen Tournament that won’t be happening this season. What is the Louisiana Purchase? I’ve noticed that in these situations you usually advocate for 2nd going big and 3rd place going small. I think that’s worth taking another look at. The second biggest piece of the pie (after first place has made a lock-out wager) is usually the triple-stumper. Second place has effectively has “dibs” on going small if they want it, since both second and third wagering small is a great for second and disastrous for third. Remember that in this game that Ian is capable of covering Sawyer’s maximum “unsafe” wager without making himself vulnerable to losing to Jenny’s MSBIW. In a Stratton’s Dilemma game 2nd has the strongest incentive to go “big” in either a scenario like this one (where 3rd can safely cover 2nd’s maximum “unsafe” wager without losing to the leader’s standard bet if wrong) or when 3rd cannot win without being right anyway (and thus has reason to bet it all). It’s when 3rd has enough to beat the leader on a TS, but not enough to do both that and cover an “unsafe” or even a zero wager out of 2nd that the incentives for 2nd to go “small” go up. Nonetheless, I wouldn’t fault a player in 2nd to go “small” if he/she is uncomfortable with the category in any SD case. Sawyer’s 0-599 + 1,000-1,799 + 2,201-3,400 range covers this effectively. Ian can never get both the large and the small range, and going for the small range incurs a significant risk of getting neither. (To go small, Ian needs to predict which subrange Sawyer is on, and is in awful shape or even locked out if he predicts wrong and makes a wager within 600 of Sawyer’s). As long as we’re on the assumption that the small wager is more valuable, Sawyer should contest it. He will usually get it, but even if he doesn’t, he’ll effectively have made the large wager. The major risk is Jenny going small, but not enough leaders make that play. The all-in wager leaves you (approximately, looking at previous FJs, and wagering trends) at 100% or 0%. The crush wager leaves you at 70% or 29%. The null wager leaves you at 48% or 48%. This is a bit of an odd scenario, where the right wager could be any of those depending on how difficult the DD is.